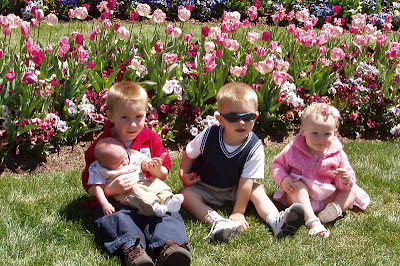 Since Monday was SO nice, we decided to go as a family to Thanksgiving Point Gardens to see all the tullips. It is my favorite time to go to the gardens! Gavin REALLY wanted to touch the tullips. 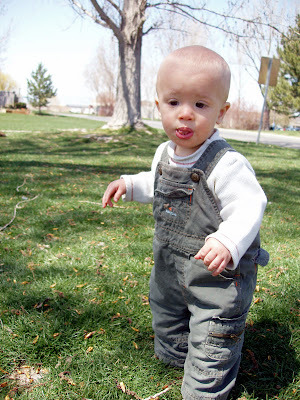 I watched my friend Ashleigh's little boy, Brady, on Monday. It was so much fun to see Gavin as "the big boy". He liked Brady, and kept wanting to poke his eyes. He thought it was pretty fun having a friend over to play with. Well, I didn't win the race...I didn't even come close to winning, but I sure was slow! I did my first triathlon on Saturday! It was quite the experience, but a rewarding one! My whole goal was to finish the race without stopping, and I did that, so I was very happy! For those of you who know me well, know I am NOT athletic AT ALL. Autumn is the athletic one out of us girls. When she started thinking about doing a triathlon a while back, I thought, "Good for you, but PLEASE don't ask me to do it with you". Of course I never said that, and she never asked. But one evening when we went out dinner with our friend Tracy, who did track with Autumn up at the U (so you know what kind of athletes they are), she tried to convince us to do a triathlon with her up at the U. I gave it some thought, and I knew Autumn really wanted to do it, but really wanted someone to workout with her, so I thought I'd atleast workout with her, but there is NO WAY that I would actually do the triathlon. When I found out that it is ONLY a 300 yard swim, 8 mile bike (off road) and a 3.1 mile run, I thought that it may be do-able, so I decided to train and do it. Thanks to Casey, Autumn and I were able to train almost everyday for the last two months. Casey would watch the boys while Autumn and I would go workout. That morning, I was NERVOUS! We met Tracy up there, and she kept saying we'll do fine. I wasn't worried about the swimming or the running, but I was really worried about the off road biking, because we had never trained off road. I did the swim fine (minus the girl who had to pass me because I was slow and the other two girls close behind me), biking wasn't too bad, it was actually fun! Beautiful view and it was fun going down some of those hills...going up, wasn't much fun! The last part was the running. I quickly dropped my bike off and started to run. My legs felt like jello, and I was really worried they wouldn't be able to stay strong, but they did and I ran the whole 5K without stopping. The best part was the end, after coming up a hill, seeing the finish line, and seeing Casey, Gavin, Autumn (who had finished long before I had), Doug and Braxton cheering me on! Thanks Autumn for pushing me to do this...it was a neat experience, and for the first time in my life, I was called and athlete. 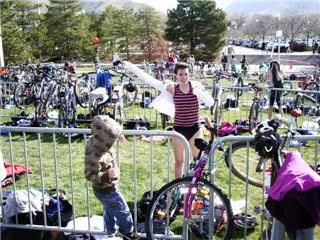 I just got finished swimming, now I am quickly putting on my clothes ready to start the bike ride. haha...don't you love my pink bike? This was the bike I had in jr. high! I think it was the only pink one there. Can you see my big smile? Almost to the end! One thing I love about Casey, is that when he gets excited about something, he gets REALLY excited. Well, he just got him some new dutch ovens, and has been having so much fun cooking in them. The first night we got them, he wanted to make his Dad's famous dutch oven recipe's: baked beans and mountain man breakfast....so we made both of them. Two interesting meals to have together. The next night, we had my parents and Autumn and Doug over for the Jazz game, so we had a BBQ with baked beans from the dutch oven, and then I made peach cobbler in the dutch oven. Yum! We put a swing up in one of the trees in the backyard. Gavin LOVES it! If he is in the house, and is looking out the window and sees the swing, he points and says "Oooh!" 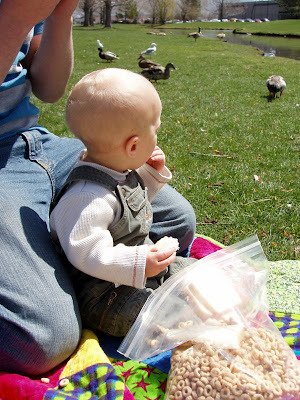 On Friday we took another trip to the park. Gavin had so much fun climbing the stairs. He even went down the slide a few times on his own! He doesn't quite have enough courage to go down on own, so I have to push him. He thinks it is so much fun. Trying to figure out how to go down. Some day we'll get it! *He can say "mom", "dada", "hi", and "more"
*LOVES food. He could eat all day long if I kept giving him food. I don't know what his favorite food is, because he eats EVERYTHING! *Loves to take baths. He really likes to play with the plug and let all the water out. *He gets really excited when Dad comes home from work. *He is a momma's boy. It has been an AMAZING year. I feel so blessed to have such a sweet boy in my life. Gavin turned 1 year old! It amazes me how fast it has gone! 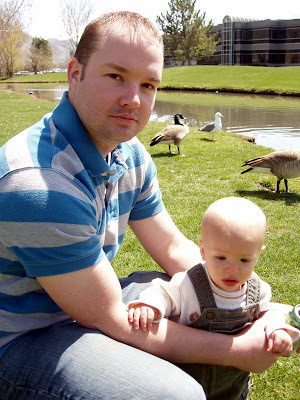 Casey took the day off of work, and I had work off because of Spring Break, so we were able to spend all day with him. 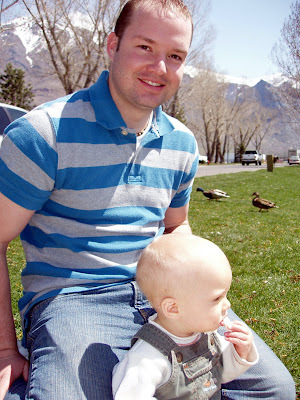 We took a little drive to a little stream in Springville and had a picnic and fed the ducks and geese that were there. 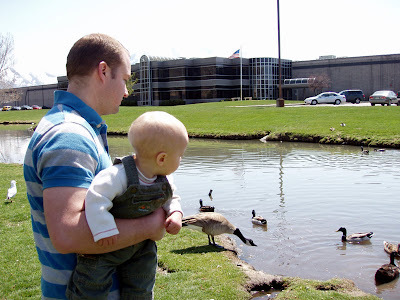 Gavin loved to watch the ducks. I couldn't get his eyes off of them for a picture! 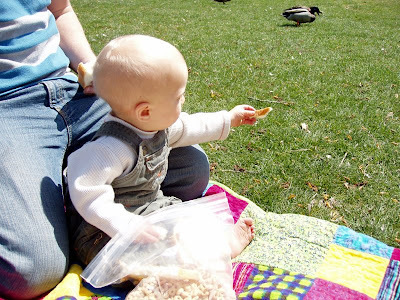 He was suppose to feed the ducks bread and cheerios, but I think he thought they were for him! Opening his presents from mom and dad. We got him his big boy car seat (that he can't sit forward in yet...he has a few more pounds to gain! ), a summer outfit, a car, and a phone. Yes, he already is racking up our cell phone minutes, so we had to get him his own phone. He LOVED brushing his teeth (all 2 of them) with his new toothbrush. Cheese! Casey and I just got this new camera today to celebrate making it a whole year being parents! Later, we had Casey's parents over for dinner. We had food Gavin could eat...sloppy joes, pineapple, jello, and his favorite...peas! I made a carrot cake that he loved! Grandma and Grandpa Losee got him a bus that makes noise. He'll have a lot of fun pushing that around! Happy Birthday Gavin! We love you!